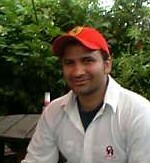 Usman was found wandering around near a pre season net session held by the Idlers in 2005. He introduced himself as realatively new to the country and a keen cricketer and it soon became apparent that even though slightly rusty, his ability to mix changes of pace with warnesque amounts of turn would be a valuable asset to any team. Usman was snapped up for the 2005 season and quickly showed his promise, taking two 6fers and two 5fers in his first 8 matches to lead the teams wicket taking table and actually be the first man in 4 seasons to knock first Idler of the year Nick Lawrence off the top. After a pre season friendly where he smashed 3 quick sixes, his batting has seemed disjointed, relying mostly on a big slog accross the line often not quite making it to double figures. A true gentleman, refusing to play against Andover IV's as he nets with them during the week and looking slightly embarrassed upon ripping through his wednesday team Wilton, what he lacks in agression he certainly makes up with cunning. Click here for a run down of all Usman Shakoor's stats by season.